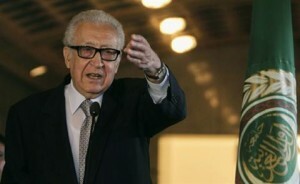 The NNA said the General Security chief and Brahimi addressed the role that the U.N. could play to help resolve the case. The two also discussed recent developments in the region, the state-run agency’s report said. Aleppo’s Greek Orthodox Archbishop Paul Yazigi and Syriac Orthodox Archbishop Yohanna Ibrahim were abducted in April by armed men near the Turkish border. Qatar’s Emir Sheikh Tamim bin Hamid al-Thani has vowed to help resolve the case.